Today I wanted a burger in a bun not just any burger and a lousy bun is the last thing I considered tucking my burger into so my day began with making fresh brioche burger buns since the closest grocery store doesn’t make them and I don’t think that driving 40+ rt miles is in order for me today. The NYT recipe that I use was not at all complicated nor did I need an overnight resting time or dry milk like some others. Thanks to Kitchen Sanctuary’s blog that I just discovered the instructions are more explicit and she has excellent photos for the beginner so I have included a link to her blog as well as the NYT Light Brioche Buns Recipe. I might add that they freeze beautifully when wrapped and packaged properly. 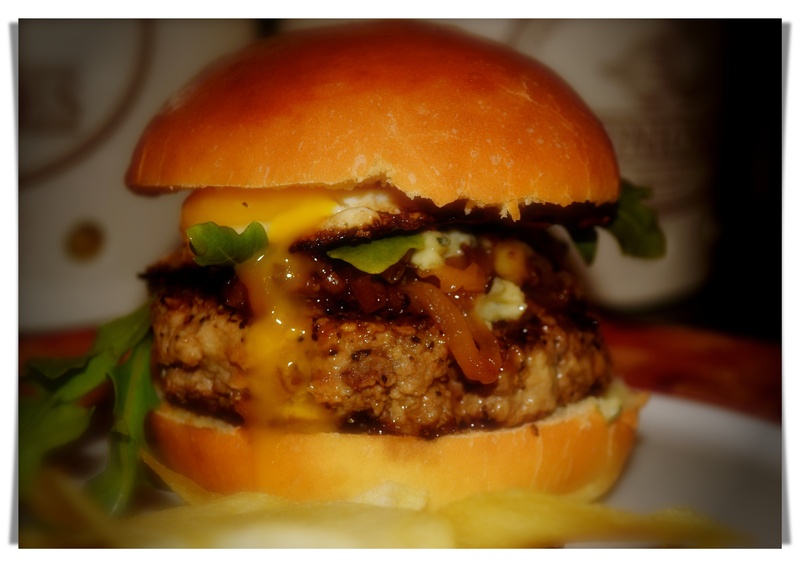 My burger was a blend of pork and beef because I was mixing thing for a meatloaf and adorned with a few caramelized onions, Roquefort cheese and a plump fried egg. I only wish that I had real fries to swish into the oozey egg yolk.